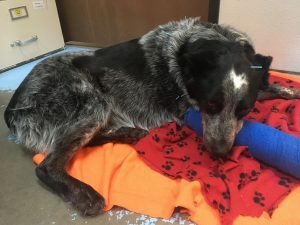 Abstract: Daisy is a nine year old female spayed Queensland Blue Heeler who presented for mid-transverse radial fracture and brachial plexus avulsion of the right front leg. Injuries were due to chasing the FedEx truck and being pulled under the tire. Surgical repair was declined and supportive care was elected which consisted of splinting the right front leg, pain medication, K-laser therapy and acupuncture. Early in treatment Daisy was not maintained in a dry confined area at home and her splint became wet and she was able to chew at her foot. This caused much tissue damage, maceration and infection of her right front paw. It was decided to board Daisy at the clinic where she could be kept confined and her splint changed more regularly. 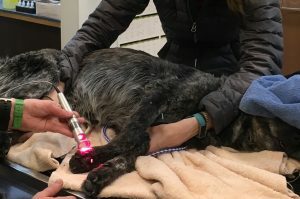 In addition she would receive laser therapy and acupuncture to help treat the radial fracture, brachial plexus avulsion and damaged paw tissue. Laser therapy and acupuncture were beneficial for healing the infected/macerated paw and regaining some function of the right front leg. History and Presentation: Daisy is a 9 year old female spayed Queensland Blue Heeler who presented on January 16th, 2018, for right forelimb lameness and road rash. She acquired these injuries by chasing the FedEx truck and being pulled under the tire. Following the truck trauma Daisy was immediately brought to the clinic. Daisy is a semi-retired herding dog and has been an excellent working dog for years. She is very loyal to her owner and is known to be cantankerous and sometimes will bite strangers. No prior health issues but has had routine spay and laceration repair below the right stifle. Bloodwork was not done at the time of the accident and prior bloodwork was declined by the owner. She is regularly administered Nexgard and dewormed with Drontal. Physical Examination: Upon physical exam Daisy was bright, nervous, alert and responsive. Temperature was 100.7°F, she was panting and had a pulse of 140 beats/minute. She had road rash on her ventral chin and abrasions on the rostral gums. There was suspect crackling/wheezes in the cranio-ventral lung fields and the heart ausculted within normal limits. She had a grade IV right forelimb lameness and was holding up her dangling paw. There was crepitus and lateral laxity in the carpus. She was dragging her front paw and the dorsal aspect of the paw was rubbing on the ground. Proprioception was diminished in the right front leg and diminished deep pain was noted. Right forelimb radiographic findings: mid-transverse fracture of the radius with minimal displacement. Initial Medical Decision Making: Discussed with owner that the best treatment for the radial fracture was surgical repair. The owner declined surgical repair so the possibility of radial fracture healing via a splint alone was discussed. It was also explained to the owner that with a splint it would be impossible to completely immobilize the joints above and below the fracture. For the fracture to heal using the splint would require 8-10 wks. of restricted activity and frequent splint changes. Patient was given injectable Rimadyl and butorphanol initially for pain. The following day an orthopedic referral veterinarian came to assess Daisy. He thought that Daisy may be dragging her paw due to the radial fracture. He created a splint with cast material and recommended splint changes every 2 wks. and her splint be kept clean and dry. Due to diminished proprioception and deep pain of the right forelimb there was likely nerve damage to the brachial plexus (brachial plexus avulsion), which is a common sequelae of road traffic accidents. Prognosis for full recovery of brachial plexus is guarded and only time will tell. Daisy went home on 1/18/18 and she was put on 100 mg gabapentin q 12 hours and 75 mg Rimadyl q 24 hours. Owner was given instructions to keep bandage clean and dry. The first and second bandage changes went well and the bandage was kept clean/dry. On 2/7/18 Daisy came in for a bandage change and the bandage was found to be wet and the Vetwrap at the top of the splint was too tight which may have caused a reperfusion injury. The toes and paw were very swollen and macerated. Deep pain and withdrawal reflexes were intact. The foot was soaked in dilute chlorhexidine solution and Daisy was put on 500 mg cephalexin q 12 hours for 10 days. On 2/15/18 Daisy came in for another splint change. The toes were still swollen, there was dark blood oozing between the toes, a foul smell and the underside of the foot was slimy. The foot was cleaned and re-bandaged. Prognosis for the foot was guarded at this time due to the reperfusion injury and the infection in the foot. I suggested we treat the infected foot, radial fracture and brachial plexus avulsion with acupuncture and laser therapy. The owner approved of this treatment and the following day it was started. Later Medical Decision Making for Acupuncture and Laser therapy: As of 2/16/18 Daisy was still dragging her right front leg in the splint. Based upon my myofascial palpation exam there was significant muscle atrophy of the right supraspinatus, infraspinatus, triceps, biceps, and digital flexor and extensor muscles. These findings correlate with brachial plexus avulsion and specific injury to the suprascapular and radial nerves. Range of motion of the carpus and elbow had decreased and there was a pain response when I manipulated these joints. Deep pain and withdrawal reflexes were still intact. Acupuncture could aid by stimulating the suprascapular and radial nerve thus possibly regaining some function back to the right forelimb. The paw was infected with maceration of tissue. I discussed with the owner and colleagues that acupuncture can stimulate the immune system and can help with the infection and maceration injury of the foot by stimulating immune cells and increasing blood flow. Laser would also help by decreasing swelling/inflammation. Laser and acupuncture may also be beneficial for the radial fracture by increasing blood flow to the fracture site thus enhancing fracture repair. 1. Right forelimb lameness/disuse was due to brachial plexus avulsion which included damage to the suprascapular and radial nerves. Damage to these nerves was due to trauma caused by the automobile accident. The radial fracture also contributed to the lameness. 2. Radial fracture was due to trauma received by the automobile accident. 3. The swollen/macerated right front foot was likely due to the combination of a reperfusion injury and bacterial infection of the foot. The reperfusion injury was due to the bandage being too tight at the proximal aspect. The reperfusion injury in addition to the wet bandage allowed for a good environment for bacteria to infect the foot. Acupuncture Treatments: Daisy was treated 2-3 times weekly for 4 weeks with 0.2mm X 30 mm Seirin coated needles. Each treatment lasted 20-25 minutes with needles in place for 10-15 minutes. The following parasympathomimetic treatments were placed first and used to help reduce anxiety and help Daisy relax: GV 14, GV 20, ST 36, Bai Hui, LI 11 and LI 4. Needling GV 14 also allowed for stimulation of the cervicothoracic spinal nerve that is used to treat thoracic limb pain and weakness. Large intestine 4 and LI 11 were also chosen to stimulate the radial nerve. Lung 5 was chosen due to its association with the radial and musculocutaneous nerves and this point is used for the treatment of elbow pain. Small intestine 11 and 12 were also needled due to their association with the suprascapular nerve; there is distinct muscle atrophy in the supraspinatus and infraspinatus muscles. The other atrophied muscles were needled at treatments and those included: triceps brachii, deltoid, brachialis, biceps brachii, extensor carpi radialis and digital flexor muscles. Bladder points 11 and 12 were used due to their association with the cervicothoracic spinal segments. Bladder points 13-15 were also needled due to their close proximity to the injured limb. Baxie points were used on the right front leg for the first two weeks and then when there was significant swelling in the toes (4th wk). These points were chosen due to their close proximity to the infected/macerated paw and toes, I considered it a variation of circle the dragon approach. The baxie points were used to stimulate the digital nerves but they were mainly used to stimulate inflammatory cells and blood flow to the infected/macerated tissue. Daisy received electroacupuncture on March 13th and 16th, 2018. The electroacupuncture unit used was an E-Stim II and was set at 2Hz/100Hz for 10 minutes. Points chosen for electroacupuncture were HT 1 and LI 11 due to their association with the radial nerve and are points commonly chosen for brachial plexus avulsion. The K-Laser/Class IV Laser (Laser Therapy Products, LLC) was used twice weekly for 4 weeks. Laser was set on chronic wounds for dark skin for a 70-200 cm2 wound size to treat the macerated paw. Power was set at 3 watts, 756 Joules for 252 seconds. A second laser treatment was done using the chronic musculoskeletal treatment for the fracture repair and atrophied muscles. Power was set for a 31-60 lb. dog for a target dosage of 6-7 Joules/cm2. dermatitis persisted interdigitally but I attribute that to always having to have the foot in a splint. I think that the acupuncture and laser was an additional treatment that aided in the healing of the paw and saving the paw. These two treatments increased blood flow and immune cells to the infected tissue which allowed for increased healing. Oral antibiotics and soaking the foot every 2-3 day also aided in the foot healing. It is more difficult to assess the brachial plexus avulsion treatment due to the leg remaining in the splint for the radial fracture. Daisy has maintained withdrawal reflex and deep pain response in her right front limb and her withdrawal reflex has even quickened with time. The muscles of the front limb have atrophied as the weeks have progressed but I do think the acupuncture and laser therapy have allowed for her to maintain and regain some function of her right front limb. She does tend to drag her front leg in the splint but I have noticed that she is starting to move the splint forward when she walks instead of constantly dragging it. It has only been 8 weeks since the accident so I am hopeful that once the radial fracture has completely healed and the splint is off that Daisy will have more capability to use her right forelimb and bear weight on it. It is likely that Daisy will not regain full function of her limb but I am hopeful that with time she will gain some function back. 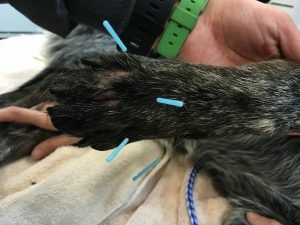 Description of Medical Acupuncture Experience: Daisy’s case was a complicated multifactorial case that initially began with a radial fracture and brachial plexus avulsion and was compounded by infection/maceration of the paw due to lack of compliance. I was very impressed with how the acupuncture and laser therapy sped up healing time and saved the paw. Without the use of these treatment modalities I do not know if the paw could have been saved. I believe acupuncture and laser therapy increased blood flow and attracted inflammatory cells to the site of infection in the paw. A study by Park et al. (2012) showed that acupuncture increased cell proliferation and development of new blood vessels in rats with wounds. I think more chronic wound healing studies should be done in practice to further asses acupuncture and laser treatments with other types of wounds. Paw healing was not the only aspect that improved with Daisy; her attitude and anxiety level improved. Initially she was very anxious and somewhat fractious with her treatments. As time went on her anxiety level decreased and she was less fractious for treatments. I would perform some of her treatments on a dog bed in my office. With later treatments she would immediately go to my office and lay on her bed as if she looked forward to treatments. She had a history of being a fractious herding dog but with time and treatments she mellowed out and all the staff could pet and handle her without the need for restraint. The treatments not only helped her paw but they also improved her anxiety and attitude for which I was very impressed. I learned through this experience that acupuncture and laser therapy are very helpful modes of treatment of varying types of issues and I look forward to treating more patients with these modalities. Park S, Sunwoo Y, Jung Y, Chang W, Park M, Chung Y, Maeng L, Han Y, Shin H, Lee J, Lee S. Therapeutic Effects of Acupuncture through Enhancement of Functional Angiogenesis and Granulogenesis in Rat Wound Healing. Evidence-Based Complementary and Alternative Medicine. Volume 2012, Article ID 464586, 10 pages.